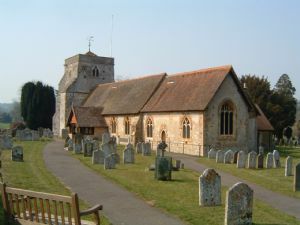 The Church of Fermesham has been moved this year from the place where it was first sited to another place with the advice and help of Luke Archdeacon of Surrey, and in the same year it has been dedicated. Nothing is known of its previous site, but as to the likely cause of the removal, the Annals tell of massive storms in the area in the 1230s. In one of these, the Abbey buildings were flooded by the river Wey to a depth of eight feet — a mere four miles downstream from Frensham. Archdeacon Luke des Roches is believed to have been a relative of Peter des Roches, a French soldier who was Bishop of Winchester from 1204 to 1238. 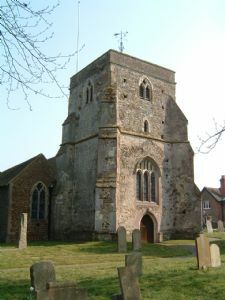 The Tower is of the 14th century, with massive diagonal buttresses. Probably not all constructed at ihe same time, the 'false arch' over the west window is thought to have been due to interruption of building at the time of the Black Death (1347-51». The numerous changes to which it has been subjected over the centuries make interpretation of the present condition difficult. It was last restored in 1929, having been heavily damaged by overgrowth of ivy. There are eight bells, of various dates between 1627 and the present century. 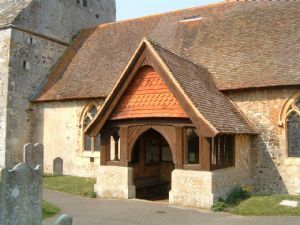 The Porch is believed to be of the 15th century, although restored. There are mediaeval figures carved in the timber at the ends of two of the central rafters. Close to the door, the ledger stone of a 13th century coffin has been mounted. The carved cross thereon is identical with that of Archbishop Stephen Langton (who died in 1228) in Canterbury Cathedral. A skull was removed from it, and reburied, in 1870.